Brady is proud to have developed and commercialized the only roll-stock, RFID printing and encoding system for on-metal part applications for the aerospace industry. 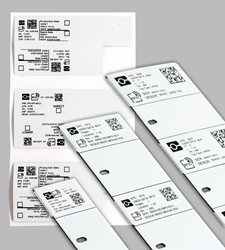 Brady (NYSE:BRC), a global leader in industrial and safety printing systems and solutions, today announced that its aerospace RFID (radio frequency identification) tags have been approved for use in Boeing’s commercial airplane programs. These tags include both Brady's on-metal and off-metal tags that are used to wirelessly identify flyable parts throughout an aircraft and track information about component history. Contact our dedicated Boeing Strategic Account Manager, Brad Williams, at brad_williams(at)bradycorp(dot)com. For Brady’s complete product offering, visit BradyID.com.